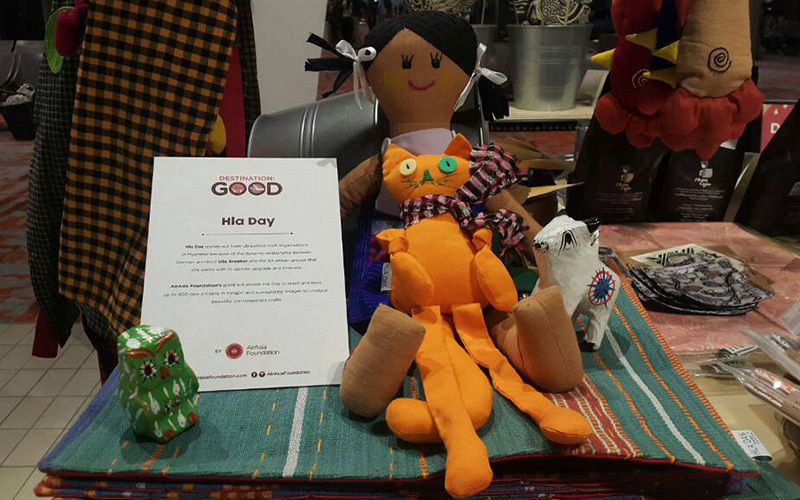 One of the perks of being a supporter of social enterprises in Asean is that our small team has been able to travel the region, meet social entrepreneurs and shop their gorgeous products. To bring their wares to AirAsia travellers, our initial plan was to make them available for sale onboard but this got rather complicated as space on each aircraft is limited. Besides, it’s hard for shoppers to fully appreciate the qualities of handmade crafts from a printed page. We were cracking our heads when a golden opportunity came up. To celebrate the 50th anniversary of ASEAN this year, Malaysia Airports decided to offer us retail space at klia2 to set up shop! It was perfect as AirAsia Foundation happens to be an accredited ASEAN civil society organisation. We got to work quickly and in August, opened our ‘Destination: GOOD’ pop-up shop at the satellite terminal at klia2. Destination: GOOD pop-up@klia2 is located at the departure hall between P&Q gates. Our shelves are now filled with products made fully in support of a social enterprise or a non-profit. In our selection, we pick only items that are handmade from natural materials or upcycled materials. No plastic is allowed unless it is recycled plastic. In fact, one of the most popular items at the shop is our bamboo straws by the Tak Nak Straw (Don’t Want Straw) movement. These came into being out of concern over plastic pollution in our oceans and their detrimental impact on marine wildlife. Above all, the one common factor that unites all the products at Destination: GOOD is that they all have a story to tell. Among them, the Selaka Kotagede (Indonesia) silver items and Zo Project (Vietnam) notebooks are made by artisans who are trying to keep alive centuries-old traditions. Olivia&Diego works with human trafficking survivors to create artisanal jewellery that are bright and cheerful, much like the new beginning they are giving to the artisans who make them. Ever popular and in short supply are also the lovely pandanus pouches by Gerai OA that are made by indigenous groups in Malaysia who face depleting natural resources. A Selaka Kotagede silversmith at work. So when you come to Destination: GOOD, do more than shop. Check out the social enterprises’ background on our infoboards or ask our staff to tell you more. You’ll come away with a warm fuzzy feeling that your purchase will not only bring joy to the one receiving but also its maker. Read more about our products on our Destination: GOOD Infoboards.